A free utility for browsing most recently used (MRU) file lists of programs like Visual Studio, Word, Excel, PowerPoint and more. Quickly open files, jump to their folder in Windows Explorer, copy them (and their path) to the clipboard - all with just a few keystrokes or mouse clicks.. Upgrading from an ealier version? Simply run the new setup, no need to uninstall the old version first. Your existing custom actions will continue to run. Take a look at the new macros for file and directory paths if you want to make your custom actions more portable and robust. Installing a custom action is now just "copy here, paste there". Visit the the custom action repository on GitHub for details. Want to write your own custom actions? The new step-by-step guide gets you started in no time! Quickly access most recently used projects in Visual Studio 2008 - 2017. Specify that a project should be opened in Visual Studio "as administrator". Open files/directories in Visual Studio Code. Quickly access most recently used projects in Blend. 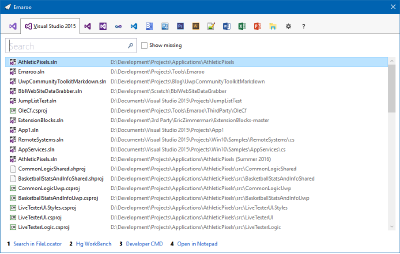 Open the project directory in Window Explorer. Copy the project file/directory to the clipboard. Run ".exe" or ".cmd" files in the project directory. Quickly open ReadMe files (HTML/Markdown) in the project directory. Use a custom action to call a tool of your choice and pass the selected file or directory as an argument. Open old projects in newer versions of Visual Studio. Open the directory of a Visual Studio project in Visual Studio Code. Quickly access most recently used Word/Excel/PowerPoint documents. Open the directory containing a document in Windows Explorer. Copy the document to the clipboard. Use a custom action to call a program of your choice and pass the selected file or directory as an arguments. Create a new mail in Outlook, with the selected file as an attachment. Quickly access most recently used Photoshop/Illustrator/InDesign files. Quickly access most recently used Affinity Photo/Designer files. Open the directory containing a file in Windows Explorer. Copy the file to the clipboard. Open most recently used Photoshop files in Affinity Photo. Open most recently used Illustrator files in Affinity Designer. Tip: Use a global hotkey! For a tool like Emaroo that is started rather often and is easy to use via keyboard, it makes sense to launch it using a global hotkey. The easiest way to do this in Windows 7 and up is to pin Emaroo to the task bar and start it using Win+<digit> (with <digit> corresponding to the position of the icon in the task bar). What does the name "Emaroo" stand for? Emaroo is inspired by "most recently used" = MRU = "em ar you". I took artistic liberty to change the pronouncation to create a short name that looks good in written form. What does "free" mean, what's the license for the application? Emaroo is "free" as in "free beer". See the license for more information.